​For centuries, raw, undiluted honey has been used to treat all sorts of ailments. It can be applied topically to heal wounds and rashes, or it can be taken internally to treat infections ,promote intestinal health and build immunity. The main health benefits for which we extol raw honey today come from its' unique blend of vitamins, minerals, enzymes, antioxidants, phytonutrients and other health components that it possesses. ​Our honey is always raw so as to retain the amazing health benefits of this golden goodness! St. Seraphim was an 18th century Russian Orthodox monk who lived a simple existence in a dense pine forest on the shore of the Sarovka River. His Christian-centered life created a relationship with wild creatures in which love was the ruling force of life. One day a nun came to visit him and found the old monk sitting on a log feeding bread to a wild bear. She was startled and let out a scream. The elder said, Misha, why are scaring the orphans? You'd better go and get some sort of consoltation, or I won't have anything to treat them to." 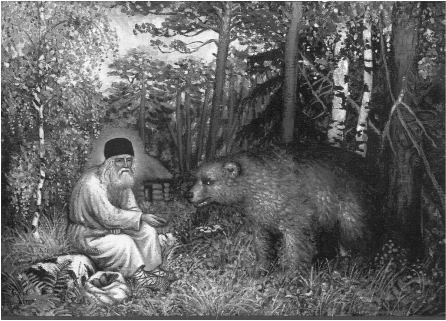 Shortly after, the bear returned with a wild honeycomb wrapped in leaves and humbly dropped it at the feet of the saint. The elder took the honey, gave the bear a piece of bread and frearlessly bade him depart.